Republican lawmakers in numerous states are pushing legislation that would place restrictions on protesting rights. According to The Washington Post, the bills being introduced in 17 states would ramp up punishments for protesters who block highways and ban the use of masks, among other restrictions, in an effort to counter what Republicans say are manufactured, “paid,” and “professional” protesters. Lee Rowland of the American Civil Liberties Union said the GOP lawmakers pushing these bills want to increase “penalties for protest-related activity to the point that it results in self-censorship among protesters who have every intention to obey the law.” Demonstrations have been taking place nationwide since the election of Donald Trump as president, and Republican lawmakers have been facing angry constituents at town halls in their home states. President Trump has dismissed the protests as being largely organized by liberal activists. Once the land of the free. Now a one party state. Lead by an oppressive Dictator who outlaws the press and free speech. The Foundling Fathers are weeping. No one should be allowed to wear a mask when "protesting". 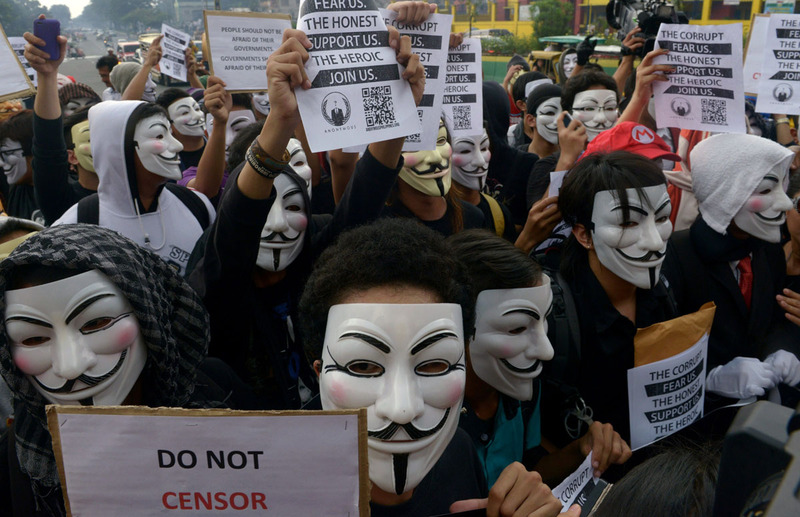 nicko wrote: No one should be allowed to wear a mask when "protesting". If they are not committing a crime? Does that include the white hoods of the KKK? Angry Andy wrote: Does that include the white hoods of the KKK? Whether its a symbol of hate and oppression, like the veil or burka. No outfit should be banned. Being on a march is not a criminal offense. Howver if they did commit a criminal offense, that would be different. Someone should tell Donald 'Hitler' Trump. Thorin wrote: Republican lawmakers in numerous states are pushing legislation that would place restrictions on protesting rights. According to The Washington Post, the bills being introduced in 17 states would ramp up punishments for protesters who block highways and ban the use of masks, among other restrictions, in an effort to counter what Republicans say are manufactured, “paid,” and “professional” protesters. Lee Rowland of the American Civil Liberties Union said the GOP lawmakers pushing these bills want to increase “penalties for protest-related activity to the point that it results in self-censorship among protesters who have every intention to obey the law.” Demonstrations have been taking place nationwide since the election of Donald Trump as president, and Republican lawmakers have been facing angry constituents at town halls in their home states. President Trump has dismissed the protests as being largely organized by liberal activists. 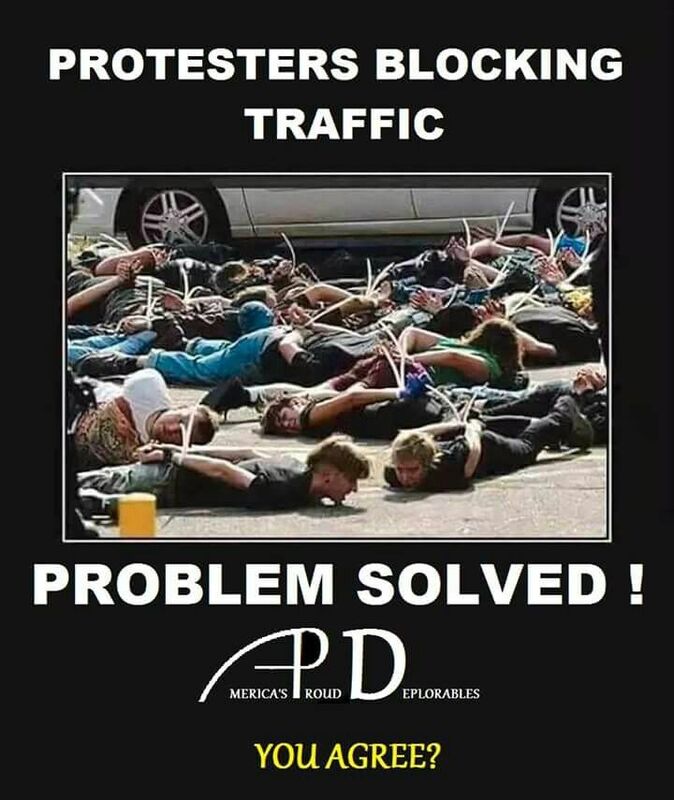 how is blocking a highway protesting? Why do protesters need to wear masks if they are behaving lawfully? a one party state with 2 parties. Marvellous. give me a single valid reason why a protester would need to wear a mask if they aren't intent on breaking the law. the only ones I can think of are extreme cold when a snow mask might be warrented or for a medical condition that requires the face to remain covered. they certainly dont need one to burn down or destroy property. They wear a mask because when/if they commit a crime they can't be identified, if they aren't going to commit a crime why wear a mask? Unless of cause they should be in work, or Mommy might see them. nicko wrote: They wear a mask because when/if they commit a crime they can't be identified, if they aren't going to commit a crime why wear a mask? Its up to them if they want to wear a mask and there could be many reasons. no, but the government of the USA may well very well make it one. And I wish our government would do the same. What if it was the victims of abuse, that wanted to remain annoymous, but also wanted to march with the protest? so once again you prove my point. they wear mask and destroy property. do you think paralysing government computer systems is OK? The Devil, You Know wrote: so once again you prove my point. they wear mask and destroy property. Do you have proof any of them have done so? Not even those pointy white hoods favoured by certain Trump supporters ??? Could be Wolfie, could be. Total waste of time. Case law has said that the First Amendment, being the democracy amendment, is the first in priority. No court is going to rule against it, particularly when there is no threat. Incidentally, the paid, professional protester allegation is a ruse. Who cares if they are paid? They are still voters. Moreover, no political demonstration is more slick and professional than a Trump rally. I would love to see a law passed, and then watch a Trump crowd arrested because they are indeed professional demonstrators. Once again, it always helps to learn a bit about why protesters might want to wear masks. So, have the CEOs crossed a line? Probably not. At least yet. When Mitt Romney campaigned at an Ohio coal mine earlier this month, he might not have realized that the miners were forced to be there — without pay — by the owner, Murray Energy. That’s according to accounts from multiple coal miners, who sent anonymous letters to a local radio station criticizing Murray Energy for allegedly requiring all workers to take the day off, forgo pay, and attend a Romney campaign event. “Just for the record, if we did not go, we knew what would happen,” wrote one miner. “Our managers communicated to our workforce that the attendance at the Romney event was mandatory, but no one was forced to attend,” Moore said. He confirmed that pay was docked for all the workers. So you have to remember that this is a country in which your employer can fire you for not forgoing a day's pay to attend a rally supporting your employer's favorite politician, and one in which employers are free to communicate to their workers that their jobs are gone if the politician they don't like wins. When your employer can fire you for exercising your right to political expression, or even for being photographed drinking the wrong beer, it is entirely reasonable that people would disguise themselves when they take part in lawful political activity. Are the Americans on here aware that the US coal mining industry is bottom of the heap when it comes to safety, workers rights, pollution controls, mine rescue services, regulatory oversights, etc. Doesn't look good when the world's #1 economy has an industry sector lagging behind the likes of China, South Africa or Brazil, does it ! As for bosses threatening their workers not to vote for the other side -- in the past, some farmers and factory owners down here have used the same tactics, urging their employees to vote conservative, otherwise they would lose their jobs. Even though ballots are secret, and it is illegal to reveal who somebody votes for -- just the threat of a sacking is often enough to scare some workers..
Ben wrote: So you have to remember that this is a country in which your employer can fire you for not forgoing a day's pay to attend a rally supporting your employer's favorite politician, and one in which employers are free to communicate to their workers that their jobs are gone if the politician they don't like wins. Google wrote: Wrongful dismissal, also called wrongful termination or wrongful discharge, is a legal phrase, describing a situation in which an employee's contract of employment has been terminated by the employer if the termination breaches one or more terms of the contract of employment, or a statute provision in employment law. The Constitution is an instance of the latter. Also, several constitutional provisions are implied in the contract of employment. Cases vary from state to state.